We can only hope..............Best all time IMHO. I still have the most recent version on a disc somewhere, but in more recent times I've been using XBMC, now known as KODI. 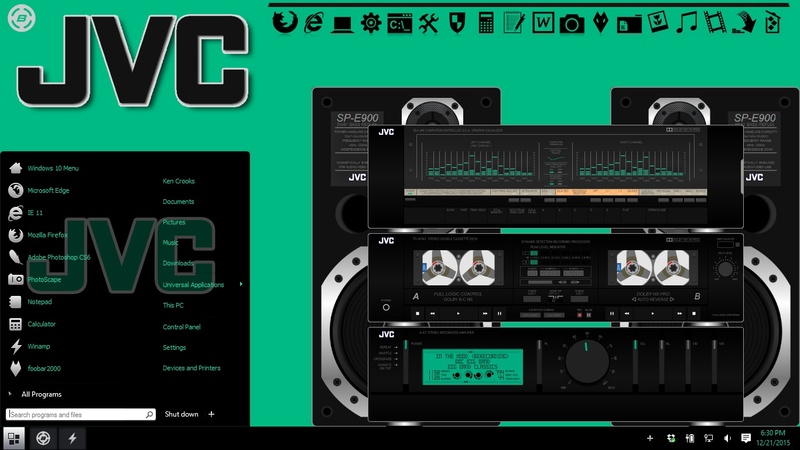 Another I've used and found decent is JetAudio [which also plays video files and has a built-in converter], but I really would welcome a WinAmp return. A new, updated version based on the original WinAmp would be fantastic. Winamp is only reduced to hype and nostalgia nowadays. Nobody really needs it anymore. There are plenty better alternatives out there. Heck, even Groove of Windows 10 is better nowadays. I still use it every day....2.9x, that is. Curiously this machine also has kJofol installed on it. I'd agree with Groove. It's pretty good. I'd like to see one player with the audio quality that DFX Audio Enhancer gives you. When I tried it several years ago DFX was an amazing add-on and beat any internal sound configuration that the current players had. I use to use DFX and I do still have it on disc. What is even better though is a izotope ozone for winamp, I have the advance version. DFX is a lot easier to use with only 5 sliders but izotope sounds better when configured properly. Now I just use Foobar 2000 which I am convinced is the best sounding player. It is just a little intimidating for first time users when it comes to modifying or configuring it. Once you get use to it and have it set up with the right plugins and EQ presets it is a really great player. By the way there is a reallly nice new winamp skin out. It is a large skin but as with all winamp skins it can be resized. Here is a short clip of it. I use J River Media Center 21. Plays Dsd files. Sounds better on my surround sound system than any other music player. I use it too. I dont even know what are the modern day alternatives. And TBH i have hard time to imagine in what way they might be better than Winamp. Perhaps if you are some kind of audiophile, but personally i just need the basic functionality, which Winamp always provided just fine to me. I also use AmazonMusic's player too which sounds OK. I have rather simplistic needs. Just my laptop and two small speakers. I use Xion because I skin it. Although I'd not recommend for higher systems. "As Bongiovi DPS 2.0 makes its world debut, it is an extended free trial until the end of the year. After the free trial is over you will be prompted to make a purchase to continue using DPS." Yes but it is not free. It is only a free trial according to what I have read which I quoted above. You should try foobar2000. Everybody use it today. No not everybody uses it because it is not a simple player. It takes a lot of getting use too for configuring plugins and skinning it. That being said it is my main player and the reason for it being my go too is I have tried about 10 players (yes there are many more) but out of the ones I have tried Foobar offers the best sound quality. Go to their website and check. It is free. Looks like it used to be a time limited demo but all I had to do was to sign up and I guess I'll get some emails from their company offering other products but its free and the software has no limitations. I don't see anywhere in the software where it says its a demo or has a time limitation and neither was that mentioned when I signed up. CNET gives it good reviews http://download.cnet.com/Bongiovi-DPS/3000-2169_4-75629300.html and googling finds a lot of good comments too. It loads on my system startup and works with any music or any sounds on your PC. Could turn out to be one of the best pieces of software I've come across in a long time..........and it appears to be free. Go to their website and check. It is free. You have to sign up and I guess I'll get some emails from their company offering other products but its free and the software has no limitations. In other words it is free for now but sometime in the new year we will have to pay if we want to keep using it. Did not get or see that message during the process or in the email from them but I guess I'll see over the coming weeks. "As Bongiovi DPS 2.0 makes its world debut get it FREE until February 1, 2016. No strings attached"
Thanks for the link Junior. I got the skin and it is AWSOME !!!! You are welcome. I made a theme to go with that skin. Which is what I said. So we have a little over one month to enjoy it for free. WOW !!! That theme is KICKASS !! Whatever..........There is no time limitation on the free usage.